The Sony Xperia Z is equipped with a 13 megapixel camera that can produce still shots with a maximum resolution of 4128 x 3096 pixels. However, if you use the default Superior auto mode, you get 12 MP 3920 x 2940 shots instead. 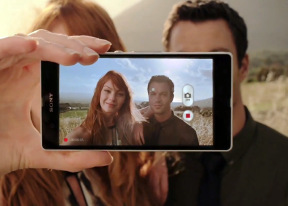 Naturally, the Sony Xperia Z camera offers all kinds of features, including face detection, smile shutter, geo-tagging, touch capture and HDR mode. There's also the home-baked quick launch mode, which lets you select what the camera shortcut on the lockscreen does. In the superior auto mode the Sony Xperia Z produces photos with pleasing, albeit slightly oversaturated colors. The resolved detail is hardly spectacular and the noise levels are only average, but the dynamic range is good and contrast is excellent. The results are pretty good overall, although we wouldn't say it has a significant advantage over the best 8MP shooters from last year. Matching their performance is still a pretty good achievement, though. We also gave the panorama feature of the Sony Xperia Z a try. The smartphone produced a 5 megapixel image with few stitching errors, which had pretty punchy colors. It's not the best panorama we have seen, but it's certainly among the better performers out there. The Sony Xperia Z challenges the best shooters in town and you can head over to our Photo quality comparison tool to see how it did. It did excellently on the first two charts, taking advantage of the superior resolution of its sensor to comfortably beat the 8MP sensor. Once we come to a more real-life scenario (third poster), the noise reduction takes its toll and the Xperia Z loses its advantage. The Sony Xperia Z is capable of capturing 1080p video footage at 30fps, which is on par with most modern day smartphones. However, as a nice extra touch the smartphone also offers HDR for video capture, making it only the second one to do so after the Oppo Find 5. What came as a disappointment for us is the fact that even though the Xperia Z is able to capture still shots while recording video, it only produces images with 1 megapixel of resolution. That's less than half the resolution of the individual frames in the video itself and not really good for much. Given that last year's flagships could capture full res stills during video recording, what the Xperia Z offers is inexcusably poor. That's a minor thing however and what's important is the Xperia Z does the major things right. Videos come up with excellent detail and a solid 30fps framerate. Their bitrate hovers about the 16MBps mark, which is a decent compromise between quality and file size. Enabling HDR doesn't do as big a difference as we hoped it will, but it still adds some detail in the highlight areas, which can make the difference between a usable and a poor video on some occassions. The Sony Xperia Z enters the arena of our video quality comparisons. The 1080p video recording of the smartphone isn't quite the best we have seen, but it fares pretty well. It easily matched the Optimus G and the Galaxy S III in the first two charts, but came out a distant third on the third chart.